Doris Mae (Moses) Quinn, the proclaimed “Mayor of Medio,” died in her sleep on August 12, 2015. She was born in Santa Barbara on April 5, 1920, the second child of Joseph Moses and Julia Castagna. Doris’s brother, “Bobby,” died very young, leaving Doris to be doted upon and adored by her loving parents. Doris’ earliest years were spent on the Moses Ranch in Carpinteria where she developed into a strong, independent girl with a deep love of nature and animals. When she was six years old, Doris’ maternal aunt gave birth to Doris’ cousin, Marjorie, and alas Doris had another child with which to share her world and life. The two girls developed a close and lifelong bond, which will exist into eternity. When Doris was seven years old, she and her parents moved from the ranch in Carpinteria to a newly built home on Medio Road in Santa Barbara. Despite her youth and small stature, she quickly established herself in the neighborhood, making her presence there known and loved. Attending local public schools, Doris graduated with the class of 1938 at Santa Barbara High School. At the age of twenty, Doris married local real estate broker Don Quinn. Together they created a wonderful life, built around their daughter Linda, their beloved horses, dogs and other adored pets. Doris was the consummate mid-century hostess, entertaining regularly at their Hope Ranch home with enthusiasm and grace. When her marriage to Don ended in 1970, Doris returned to her childhood home on Medio Road, to live with and care for Julia, her widowed mother. Although their parties were less elaborate, Doris always had an open door and plenty of refreshments to serve any friends who might stop in for a visit. Following Julia’s death in 1982, Doris made the home on Medio Road her own. At the Lower Riviera property, Doris devoted great time and energy to create and maintain a productive vegetable garden and an impressive orchard. With the help of landscapers, she created her own Shangri La, which she cherished and enjoyed until the day she left her home in 2014. Throughout her lifetime, Doris was never without at least one beloved animal companion. 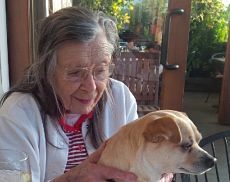 She adored dogs, the last of whom was her Chihuahua Willie. Doris cared for many cats, both domesticated and feral, and never turned her back on any creature in need. Her friends and family will always remember Doris’ incredibly generous spirit, her quick wit, and her willingness to go toe-to-toe with just about anyone. Doris was a loving and faithful daughter, cousin, wife, mother and friend. Her generosity was legendary, as was her delight in the company of her loved ones. Sadly, in 1985, Doris’ beloved cousin Margie left Santa Barbara for Northern California, and in 2001 her daughter, Linda, predeceased her. This left Doris without local family, but she was fortunate to have a large group of friends who cared about and respected her. In June 2014, Doris’ health took a turn for the worse and she was forced to leave her home on Medio Road. After several months she moved into Cliffview Terrace where she found comfort and peace. She made many new friends among the staff and residents of the facility, while still receiving visits from her many faithful friends in the community. In April, Doris celebrated her 95th birthday with friends, live music, adoration, accolades and, of course, a very large birthday cake. A graveside service was held at Calvary Cemetery on August 21, with burial in the family plot immediately following. In October 2015, there will be a memorial celebration of Doris’ life. For more information about the memorial celebration, please email stacey@staceywrightsb.com.